For the first time in Singapore Heat Branding and L'Officiel present 15 top up and coming boutique fashion and beauty brands for an ultimate day of retail indulgence. 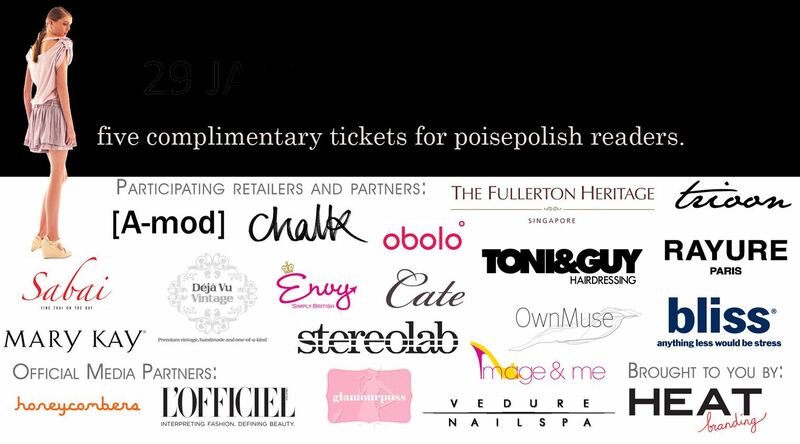 Held at the waterfront venue of Customs House Pavilion on Saturday, 29 January 2011 from 1 – 6pm, SHOP will bring to life the ultimate ladies playground; a place where fashion, beauty, cocktails and friends come together for an afternoon of retail therapy. Afterwards, get dolled up and join us for the official SHOP after party at Stereolab (Pan Pacific Hotel) starting at 10pm. All SHOP ticketholders receive complimentary entrance and two drinks upon presenting their entry ribbon. To win, comment below with your contact details. P.S. the boys are also welcomed! 5) Free entry and complimentary drinks at SHOP’s official afterparty @ Stereolab for you and two friends! Thank you for allowing me to be apart of this amazing event! can't wait to attend SHOP: The Ultimate Fashion Bazaar! can't wait to see how's its going to be!